#1 What is the minimum age to become a referee? Effective July 1, 2019 the minimum age is 13 years old. Anyone who prior to July 1, 2019 was certified as a referee and was less than 13 years old is allowed by US Soccer to continue their referee certification for the 2020 registration year and beyond. #2 When can I start my entry referee course? The online course is available immediately upon registration and payment. If logged out, log back in to the member home page and follow the links to start the online course. #3 How long does it take to complete the course or how long do I have to complete the course? Work at you own pace on your own time, but don’t take too long as there are games waiting to be refereed and assignors waiting to assign those games. #4 I just paid for a course but where do I start? 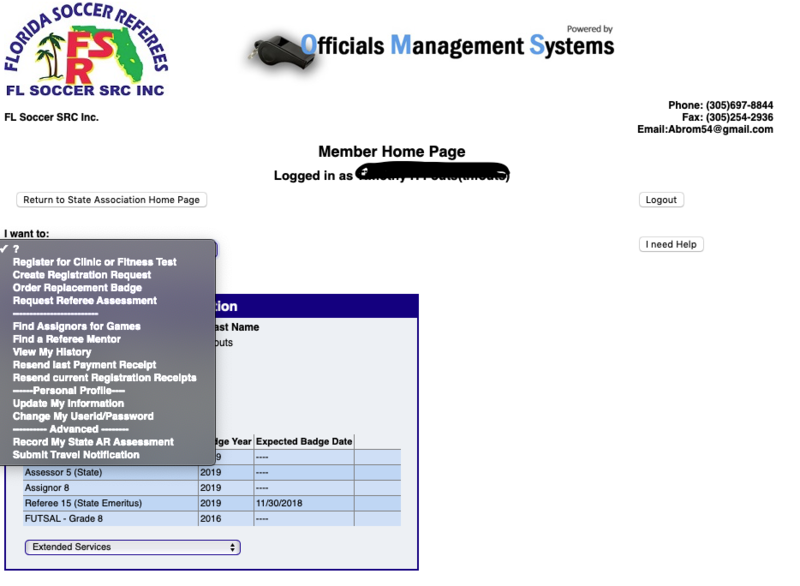 At the top of the Member Receipt if you are still on your computer screen, just below the FLSRC logo is a small button that says “Return to Member Home Page.” Once back on the Member Home Page, scroll down to the Clinics to reserve or that you have reserved section and find your courses. The two screen prints are for the Grade 8 entry class. All other classes including assignor are similar. #5 I previously signed up and paid and I am no longer on the Member Receipt page, how do I start? #6 I took the new referee entry course and I have finished my modules and test, what’s next? 3 times during each month between July and December, and twice between January and March, all course completions are exported from the registration system and sent to the United State Soccer Federation Referee Program office where a USSF ID number is assigned. 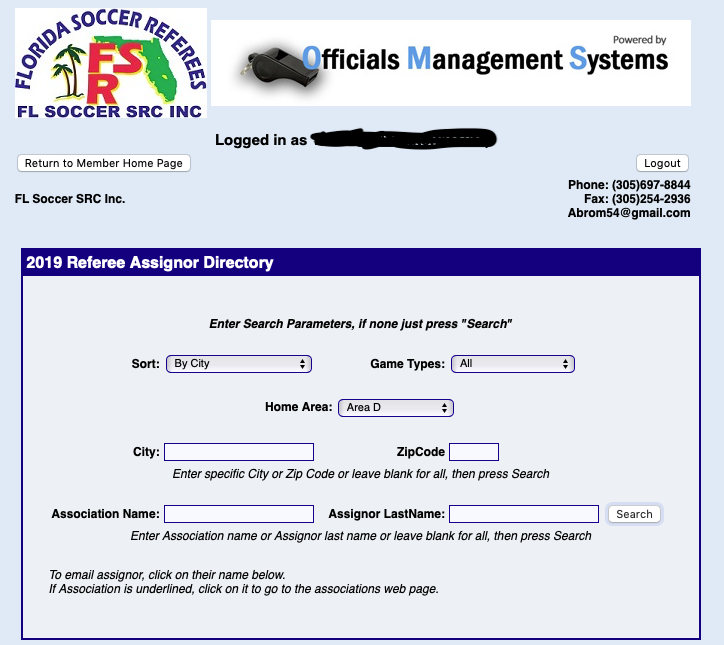 When the registration comes back with the assigned ID number, the information is sent to Florida Youth Soccer Association (FYSA). FYSA is the designated Risk Management (RM background check) authority in the State of Florida. Florida Statutes require a RM. FYSA will notify by email each new referee of their RM responsibility. Any cost for RM is between FYSA and the individual referee. Referees under the age of 18, only verify their age. Local assignors also receive the new registration information and any game assignments are made through the local assignors. FLSRC does not assign any games. FLSRC only trains and certifies annually. #7 How do I find an assignor? The following page loads for an assignor directory with various options (parameters) to use for the “find an assignor” search. There are many assignors in Florida, but not all assignors are actively assigning games. This is just a list of all assignors who are certified to assign games. #8 When do I received my referee badge? 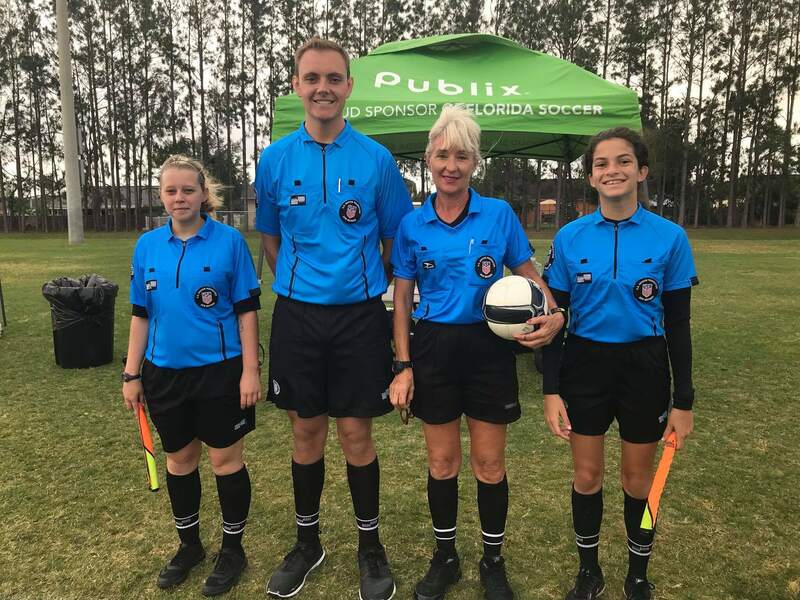 Referee badges will be issued when the registration confirmation is received in the FLSRC office from US Soccer and the badge will be mailed to the registration address previously provided. #9 When I complete the new referee course, do I have to attend a Field Training Event (FTE)? Attendance at the field training events (FTE) are NOT REQUIRED but we strongly encourage each new referee to attend. Making the transition from the classroom (computer keyboard) to the field is why the FTE’s were created. Specially trained instructors and administrators follow an approved curriculum to provide each new referee with the necessary skills and knowledge needed for their very first game. Experienced referees also attend as a refresher to sharpen their skills for their upcoming seasons. In the Library Documents section are all registration and certification requirements. Click on the appropriate document for the desired information. 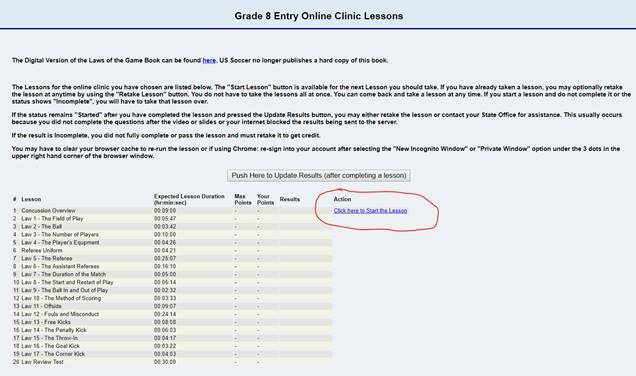 New assessment procedure for referees is also in the Library, click: How do I request an assessment? Please review the issues below before you call your ARA/A-ARA for assistance. For clarity, we have kept the Q&A’s simple. However, you may have to review all of them since your issue may involve a combination of the answers. We improve the Annual Recertification based on feedback we receive from you. We add to this page constantly, so please come back and visit before you get on the phone. Q1. I have completed all the modules and downloaded or printed my certificate, but now I want to go back and review the modules. A. The system should bring up the login page already pre-filled with your information. This means that the system remembers that you have completed the modules and will now allow you to navigate throughout all of the modules (with certain computers you may have to re-do the first module only), as long as you can see the green dot on top. However, the system will not allow you to change any of the previously completed questions. Q2. I have tried this and still does not work. What do I do now? A. The indication that the system does not remember you is an empty login page that you have to complete again. In this case, the personal information you provide MUST BE EXACTLY the same as before, otherwise, the system will decide that you are a different person and you may have to complete all of the modules again. Once you have logged in with the same information, you may have to repeat the first module “Introduction” to confirm your identity. Once you do this and close the tab, you will discover that the system has now identified you and a green completion dot appears on top. You are now free to navigate throughout the modules. Q3. I set up my computer according to instructions, I have the modules opening in a new tab but nothing happens. A. Look to see that you checked the box that says “Remember me” on the login page, below your personal information and above the Submit button. Q4. I have a Mac and I cannot follow the instructions to prepare my computer. A. The browsers for the Mac OS are a little different, so you must look in another place. If you are using Firefox, click on the “Firefox” menu and then on “Parameters”. From this point forward follow all of the instructions published for Windows. Q5. I logged on, completed a few modules, left the computer on and took a break. When I came back there was a message on my screen saying that my session with Brainshark had expired. When I attempted to log in again I discovered that I had to start from the beginning again. A. As with any interactive website, a period of inactivity will disconnect you from the site and delete all previous activity. This is done for your security. If you have previously established the Resume function, please refer to Q2 for the rest of this answer. Remember that before you walk away from your computer, pause the process and log off by answering the question. This way you establish the Resume sequence for yourself. Then you may log back in at any time. Q6. I have followed the instructions, set up my computer the way you suggest and still I am not able to get to the second module. What do I do now? Q7. I have the Certificate but I need to go back and complete the State module. What do I do? A. See Q1 or Q2. Q8. I could not complete the Assessment module because of the videos. How do I go back to complete the process? Q9. I have completed all of the modules, I am attempting to print my Certificate but nothing happens. A. If you were able to download and print any of the Attachments to the modules you completed, then please review the last few slides of the Academy module. Somehow you missed the answer to this question. What you missed is your browser’s safety question which you must answer before it will allow you to download and print your Certificate. If you could not download any of the Attachments then either your Adobe Reader is missing from your computer or it has not been activated. You need to fix this. We recommend that you download all of the Attachments provided for you. Q10. Why do I have to go through all of this just to recertify? A. The majority of our members have been requesting for years the ability to comply with the Federation mandated five (5) hour annual in-service training requirement without having to sit in a classroom environment. This process was developed to assist you in complying with this requirement, at your own time and at your convenience. Q11. Why do I have to make all these changes to my computer? A. We have no idea what type of computer, operating system or browser you use. They are similar but not the same. So we have provided the information that either confirms or creates the basic minimum requirements needed for you to complete this process. A great majority of our members do not have to make any changes, but in case you do, we offer it as a guide. Q12. Your instructions as to how to set up my computer and browser refer to Internet Explorer. I use Firefox, can you help me? A. Yes, in Firefox start with the “Tools” menu, choose “Options” and then TABS. Make sure all are checked. Then continue to CONTENT. Make sure all are checked and click on the first “Exceptions” button where you allow Brainshark as per instructions.